Written by Janet Choi on October 28, 2015 . There’s a neat arts event in my Brooklyn neighborhood one weekend every year where local artists open up their studios to the public. You get to see incredible art and talk to artists where their magic happens. This year, as I found out, there were over 300 artists participating. Even with a handy map and directory, really, where does one begin? At the last minute, I bought a ticket to the weekend’s final curator-led tour, and I was so glad I did. Instead of hunkering down in front of my laptop that afternoon, I met 5 incredible artists, a great curator, and a very smart grade-schooler who asked all the best questions. What does this have to do with email? Well, it’s the challenge of action in the face of overwhelming choice. With so much to do, it’s easy to default to nothing or too much. Most of you know that lifecycle emails can provide much-needed momentum to propel people through your various funnels. But like most endeavors worth doing, we tend to want to do “all the things.” Too often, that means getting overwhelmed and stuck not doing much — or trying to do everything at once, not doing any one thing well, and losing steam. We see this often at Customer.io. Getting started can be a struggle. So here’s a quick guide to getting started on planning effective lifecycle emails and getting your first 3 campaigns out the digital door. For example, for us at Customer.io, our 3 events look like this: When you see your users progress from steps 1 to 2 to 3, you know you’re doing a great job. But more likely than not, there are drop-offs in activity and engagement, especially in the moments right after sign-up. Each drop-off point is an opportunity for lifecycle emails to ferry users over. 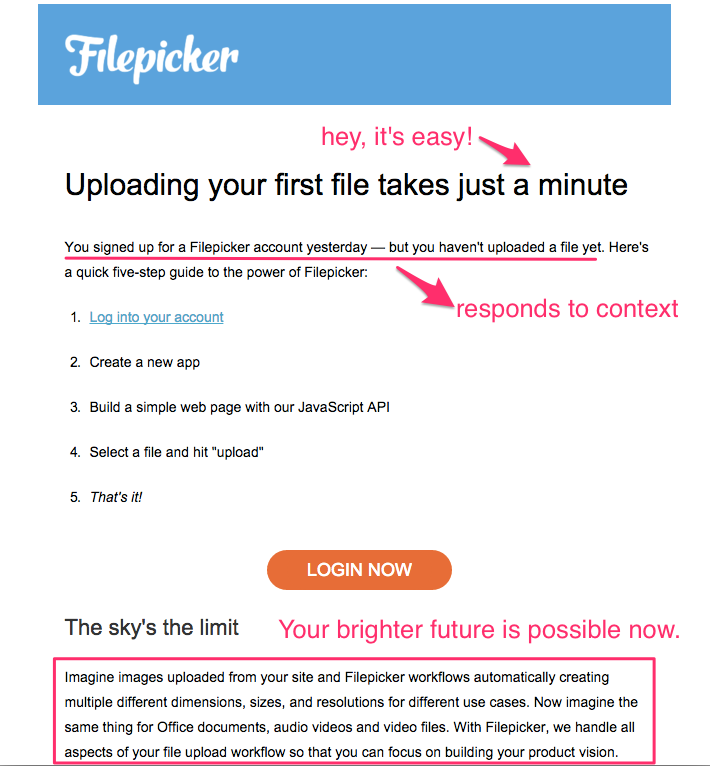 Welcome emails are one of your most critical lifecycle email opportunities. Your first few emails in this discover stage are critical for building trust with prospects and new customers to keep you mind as they continue to make their adoption and purchase decision. 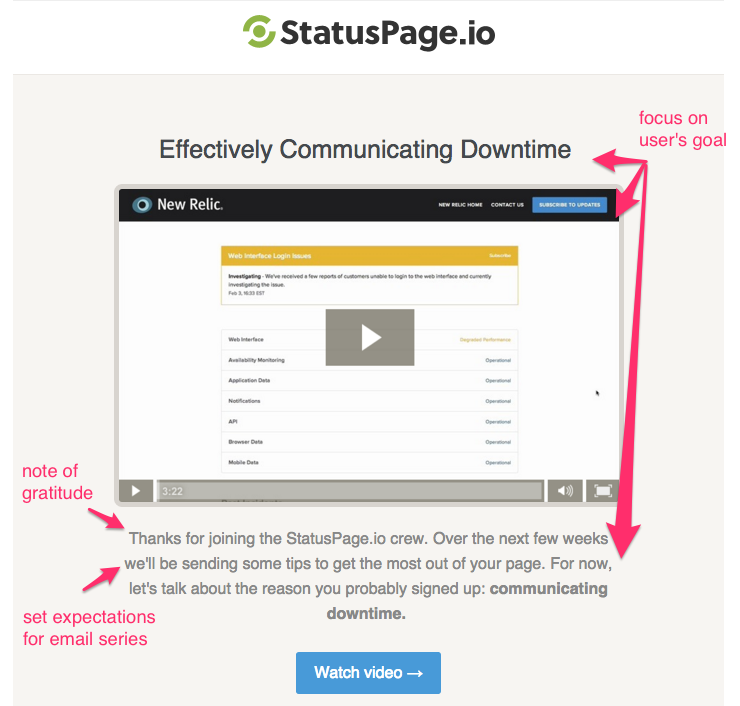 Here’s a welcome email from StatusPage.io: After a quick thank you for signing up, StatusPage.io jumps straight to the point. Their team already understood that people come in having already “bought into the idea of having a status page or get why it’s important” — so the welcome focuses on how new users can achieve their goal of communicating downtime effectively. The video linked in the email explains how StatusPage.io customers can always provide their own users with up-to-date information on service status — and how simple the process becomes when you use StatusPage.io to do it. From the get-go, there’s focus and relevance that starts the user experience off on the right foot. It can be especially tough to choose the most important action for new users to take. Often though, there’s one step that’s absolutely necessary for people to ever realize any success in a product or service. SaneBox, an email management tool that works in every inbox, triggers an activation email if you haven’t used a key feature. 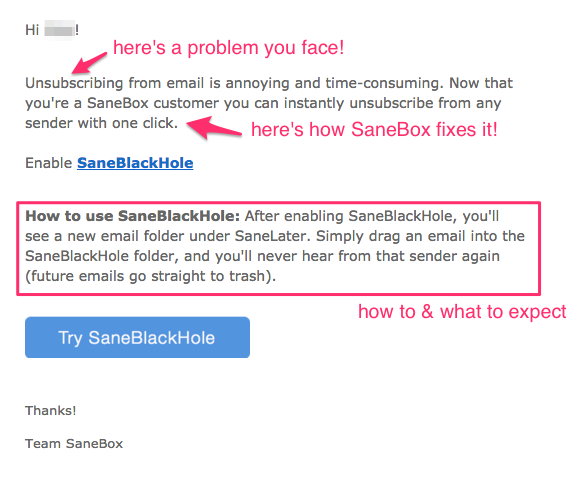 The subject line — “The most important feature you’re not using – SaneBlackHole” — adds urgency and FOMO to get the most out of the app. Giving a heads up to new users that they can now unsubscribe from any email without leaving the inbox — while making sure to target only those people who haven’t used the feature yet — helps activation without annoying people who have already taken this step. Conversion stage emails require much more than sending beseeching emails to please give you money. Nudging people to take that conversion step, as with every other lifecycle stage, requires you to be helpful along the way. The employee engagement software 15Five sends two reminder emails before your trial expires, which is helpful when you only have 14 days to try the tool. They also continue to emphasize the value of the tool in their copy and by providing a testimonial. A conversion point may come sooner than the end of a trial. 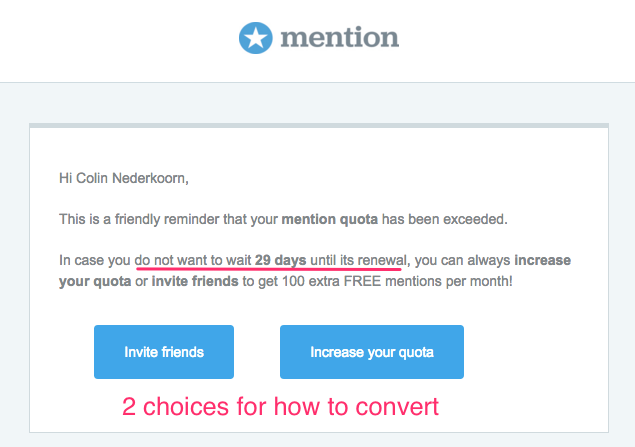 Mention, the social monitoring tool, triggers an email to super active users who have gone over their allotted free tier quota. Note that they offer not just one but two simple ways to increase your quota — upgrade to a paid plan or invite new users. Strike with triggered emails while the iron is hot — active users, who are receiving value from you, will be more likely to upgrade and refer you to others. 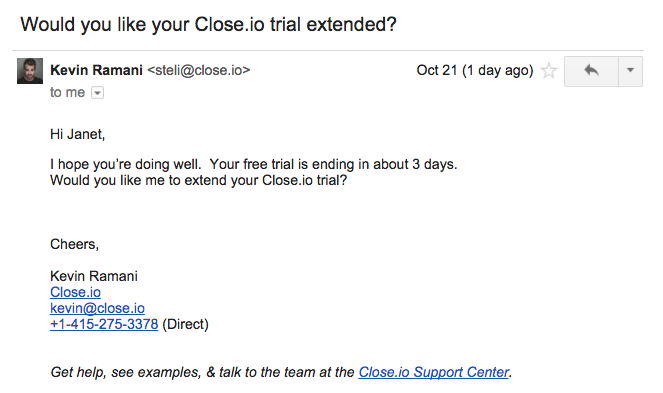 Close.io, a streamlined sales platform, also has a 14-day free trial. But they recognize that life often gets in the way of trying a new product out. 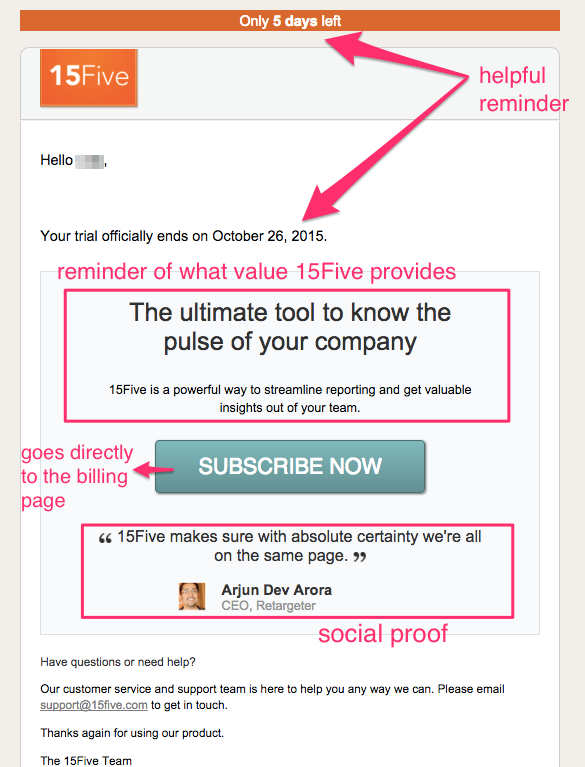 Towards the end of a trial, they trigger an email offering a trial extension. Like the Mention email above, this message offers value to both parties — the new user gets more time with a product and Close.io gets a better idea of whether someone is really interested or not. 4. Bonus round! Automate a personal email. 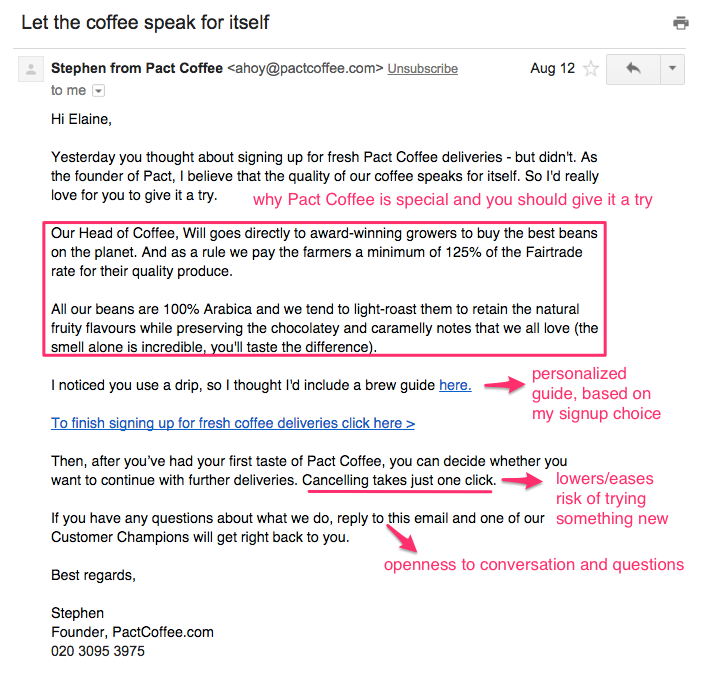 Here’s a great example created by Pact Coffee, a UK-based subscription coffee service, set to come from their CEO: If you abandon the signup process, this email gets triggered a day after a branded welcome message. Here, Stephen shares Pact’s mission and what’s so special about their coffee. The stripped-down format of this type of email forces you to avoid relying on fancy bells or whistles. In doing so with good copy and storytelling, it’s a great chance to connect with your reader. Note, too, the customized touch. As part of the signup flow, you’re asked which method you use to typically brew your coffee. Here I chose drip, and lo and behold, Stephen includes a handy link to a video brew guide using a Hario v60 drip filter. 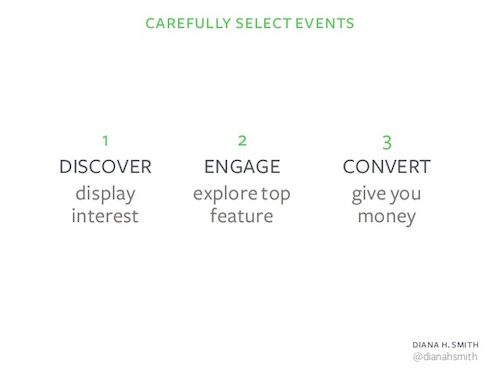 As you can see, even within these 3 lifecycle events, there are multiple steps and opportunities for emails. But with a little thought, sense of curation, and knowledge about your customers — you’ll be creating awesome email campaigns in no time! What type of email was your first campaign? Share your story or thoughts on the post in the comments!